My brother Jay recently sent me a batch of blank postcards. I was glad to get them, since my supply is down to only a few hundred. The nearby resale shop that used to sell me cards at 25¢ each, or even 12.5¢ on sale days, has jacked up the price to $2 and $3 a card. At that price, forget it. 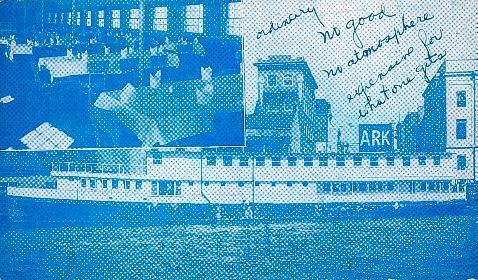 One of the cards he sent depicts Fergus' Ark, a floating seafood restaurant formerly in Wilmington, NC. The card must be 50 years old, and produced as cheaply as a color card can be -- a two-color printing job, which just screams cheap. Note the writing on the card. Someone made a comment on the restaurant, presumably after a visit, and it wasn't favorable. "ordinary no good no atmosphere expensive for what one gets"
This is scanned from the back of the card. Not the entire back, which has a space for writing a message and a address like any postcard, but only a corner of the card. The mascot fish wears a top hat and carries a cane, for that touch of piscine class. The Cafe Fear Museum web site tells me that "the first Fergus’ Ark (1952-1965) was a floating restaurant moored at the foot of Princess Street in Wilmington. The ship the Ark, originally named the General Frederick C. Hodgkins, was built in Wilmington in the early 1920s. According to the restaurant’s menu, the Ark had been a banana boat, a floating casino, a quarter boat for members U.S. Coast Guard in World War II, and, in 1946, the U.S. Maritime Commission’s office space. Then Ivon Eldridge Fergus (1914-1998) bought the Ark in September 1951 and converted it into a restaurant. "The first Fergus’ Ark closed in February 1965 so that a coast guard facility could be built in its place. Mr. Fergus then opened a Fergus Ark on Market Street and two others on Carolina Beach Road and Oleander Drive. At one point, Fergus owned four restaurants... As for the Ark, it was initially sold to a Florida businessman. Over the next decades, it changed hands a number of times yet it was still afloat in the 1990s, serving as the office of a Florida boating supply company."